In a long-awaited apology to victims of clergy sexual abuse, Bishop Leonard Blair yesterday addressed more than 200 parishioners, victims, and their supporters at St. Pius X Church - acknowledging the suffering of victims, inviting others to step forward, and declaring that Chet Warren, a former priest, had committed "grievously sinful and criminal" acts. 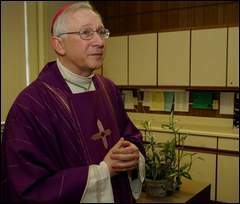 Bishop Leonard Blair issued an apology yesterday to anyone who has been sexually abused in the diocese of Toledo. Photo by The Blade / Lisa Dutton. Dressed in traditional Lenten vestments, Bishop Blair turned to Teresa Bombrys, who had been abused as a child by then-Father Warren, at the end of morning Mass. "I want to apologize to you, Teresa, in person and publicly as the bishop of Toledo for the harm you have suffered. And my apology goes to anyone who has been abused whether at this parish or anywhere in the diocese of Toledo," he said. For more than seven minutes, Bishop Blair read from a prepared statement that was later lauded by victims as possibly a pivotal event in the continuing struggle between the diocese and victims of decades-old sexual abuse. "I think that when we look back on this in history, today will stand out as a significant moment," said Barbara Blaine, an attorney and founder of the national support group for victims, Survivors Network of those Abused by Priests. Ms. Blaine, too, had accused Mr. Warren of molesting her as a child. Yesterday's public apology prompted her return visit to the parish where she had been raised, and brought both her personal crusade and her national movement full circle. Ms. Blaine told church authorities in the 1980s that Father Warren had molested her as a child, but she later learned that he continued in the ministry, despite her allegations and those of a growing number of women who said that they, too, had been abused by Mr. Warren. In 1989, she began the national victim's support group, and by 1992, when she released her name publicly as a victim in The Blade, other victims around the nation were calling on her for help and support. Mr. Warren eventually was forced from the ministry. 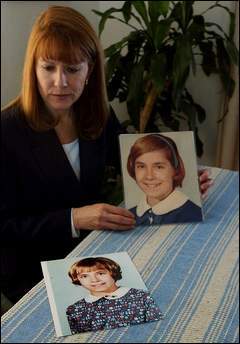 Barbara Blaine displays photos taken at the age when she was abused by a priest who was later forced out of the ministry. Photo by the Blade / Lisa Dutton. "This could be a turning point," Ms. Blaine said yesterday, calling the bishop "clearly compassionate" in his apology. His words yesterday marked the first time a Toledo bishop had apologized from the altar to a victim of sexual abuse. Portions of Bishop Blair's statement were required by a court settlement between the diocese and Ms. Bombrys, now a teacher in Columbus. Diocesan attorney Thomas Pletz also attended the service. Still, the bishop spoke slowly and deliberately, sustaining eye contact with Ms. Bombrys and supporters, and then addressing the entire congregation. "They have done something truly courageous for the good of the church community," he said, referring to Ms. Bombrys and other victims. "By exposing an evil that festered for decades, they make it possible for the healing to begin," the bishop said. 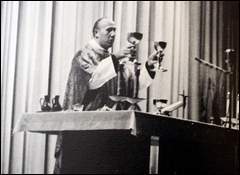 In definitive terms that surprised even victims, the bishop also cleared any doubts of the allegations against Mr. Warren, which stretch from the early 1960s at least to 1974. "Many loyal parishioners since then have felt obliged to support Warren, saying he has done much good here. It is understandable that many did not want to believe the allegations. No one wants to believe that a trusted priest would harm children," he said. "However," he added somberly, "I am here to tell you that the allegations have proven to be true." He also acknowledged that court settlements, which already amounted to more than $1.2 million and continue in court today - "pale in comparison to the human toll of these sins and crimes." "Having met with victims who were willing to meet with me, I realize how much we all need to appreciate what it was like for a victim not to have been believed, or for victims who have been tormented with the thought that they somehow contributed to the abuse … or for the victims to have seen their abuser continue unimpeded in ministry," he said. The bishop went on to urge other victims or witnesses of clergy abuse to report incidents to "civil authorities," as well as Frank DiLallo, a diocesan case manager for abuse allegations. In short comments following the Bishop's apology, the Rev. Jim Sanford, the church's pastor, also thanked Ms. Bombrys and other victims for coming forward, saying he hoped the church that had been the source of pain for so many may now be a "source of healing." Chet Warren says Mass in this 1973 Notre Dame Academy yearbook photo. Bishop Leonard Blair said abuse allegations against Mr. Warren, who has been forced from ministry, are true. Several parishioners walked from the church, brushing tears from their eyes and thanking the bishop for celebrating Mass at St. Pius. "I think there is a lot of healing that still has to happen," said longtime parishioner Marty McCabe. "The church is the people, and we as a church have to keep reaching out to victims and understand they were hurt." After the close of service, Bishop Blair met privately with several tearful victims, then held a short news conference in a nearby church office. There, he addressed the dismissal of Patti Roshak, the St. Pius secretary who last week resigned over a controversy concerning a letter from Bishop Blair to parishioners. It briefly mirrored yesterday's apology. The letter was hand-delivered to the church in December, but Ms. Roshak set it aside. Parishioners received the letter earlier this month, after Ms. Roshak realized it hadn't been sent, erased the date, and dropped it in the mail, Father Sanford has said. Father Sanford earlier told The Blade that Ms. Roshak's actions caused too much hurt. Yesterday, Ms. Bombrys asked Father Sanford and Bishop Blair to reinstate Ms. Roshak. Bishop Blair said Ms. Roshak's termination remains a parish matter. But at a nearby home after the church service, Ms. Bombrys, surrounded by friends, shook her head, adding that she never approved of the letter, even though she was supposed to approve the draft before it was sent. Ms. Roshak should not have lost her job, Ms. Bombrys said. "The fact that the secretary even had the letter was a mistake," she said. Ms. Roshak, reached after the service, said the decisions that led to her resignation were "unjust," and that she had received dozens of calls from supportive parishioners. "My phone has not stopped ringing," she said. Ms. Bombrys said she didn't want the controversy to overshadow yesterday's apology. "The whole point of the letter was to identify Chet Warren, and that has happened," Ms. Bombrys said. Contact Robin Erb at: robinerb@theblade.com or 419-724-6133.